Who needs a pricey bread machine or stand mixer? Use your slow cooker to make a loaf of bread that's crusty on the outside and soft on the inside. It takes only a minute to whip up a tasty olive oil-herb dipping sauce to go with it. It's always a good time for pizza, especially when it's this easy to make. Prep takes only 15 minutes, and then there's a delicious Chicago deep-dish style pizza waiting when you get back to your Springs luxury apartment home. No grill? No problem! Put a modern spin on the classic summer BBQ with Asian sticky sauce ribs that are fall-off-the-bone tender. You won't even miss the carbs with this tasty twist on an Italian favorite. Spaghetti squash is a healthy stand-in for pasta, and you can reduce fat by using chicken meatballs instead of traditional beef and veal. Mashed potatoes are a popular comfort food. When they're loaded with cream cheese, bacon, cheddar and pepper jack, you won't even need a main dish. Looking for a change from the usual side dishes? This rice pilaf with portobello mushrooms and green onions will be a big hit. It's also a good choice if you need a dish for a potluck or other get-together. The fresh taste of homemade salsa beats any commercial version, but it's time-consuming to make. With a slow cooker, just cut up the vegetables, toss them in with the seasonings and finish in the blender. Your kids will love this salted caramel almond granola as both a convenient breakfast and handy snack. Be sure to make an extra batch for yourself! For a decadent weekend treat, make the dough the night before, then "bake" in the morning. The heat of the slow cooker lets the dough rise and cook all in one process. Add icing for maximum gooeyness and enjoy warm sweet rolls with a cup of coffee. Carrot cake is a great way to satisfy a sweet tooth while pretending you're being healthy. As a bonus, slow cooker liners eliminate the messy clean-up of scrubbing cake pans. 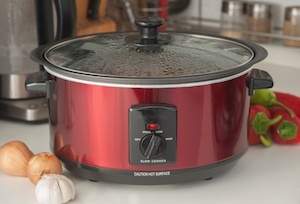 Making a cold food in a slow cooker may sound contradictory, but it works. Choose the appropriate yogurt starter for the type you want to make, such as traditional, Greek or vegan. Have you found an unexpected use for your slow cooker? Share your idea with us in the comments!